The LEG Industrie-Elektronik GmbH is specialized in manufacturing, supplying and developing of industrial electronics. Our products are own developments and only produced in Germany. Our employees are offering high-quality products and services so that customers of all industries place their trust in us. For this reason we grant a 5-years warranty * on all our products. It doesn’t matter whether you have to process or to form up analog or digital signals, we offer a wide range of products for the measuring and control technology. Our delivery program includes products as such as isolation amplifies, pulse prolongation, frequency dividers, temperature measuring transducers, level converters and other products for many uses. All products are available from stock or at short notice. Our aim is to offer you a friendly, suitable, professional high quality service. Browse our web shop for further information of our products and services. If you have any question about our products or services or if you want to speak with one of LEG Industrie-Elektronik GmbH representatives, please do not hesitate to write a mail to info@leg-gmbh.de or to call us, tel +49 (0) 2162-5030621. For LEG Industrie-Elektronik GmbH the customer is most important. *Warranty conditions cf.each data brochure. 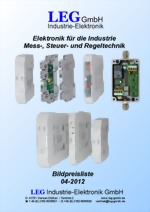 Copyright 2017 LEG Industrie-Elektronik GmbH. All rights reserved.